In season 2, episode 5 of The F Word, Gordon Ramsey shares his recipe for stuffed chicken. Gordon Ramsey’s Stuffed Chicken Legs with Marsala Sauce is really a recipe seems complicated and fancy, but will be pretty simple. Just keep to the directions below for just a fantastic meal. 1. Combine sausage, pistachios, thyme, parsley, along with a dash of both salt and pepper as a whole in a bowl. Place the mixture on the center with the chicken and roll the chicken over until it covers majority with the stuffing. Set aside. 2. Take a large little bit of aluminum foil, and drizzle 1 tablespoon of coconut oil all over it. Season the foil with salt and pepper and lay out 4 strips of bacon on the foil close enough to the spot that the sides of the piece are touching. Place the stuffed chicken thigh close to top from the bacon and roll the foil over and done with the bacon all the way around and squeeze the ends on the foil nice and tight such as a tootsie roll. 3. Bring a pot of water to your boil and after that place the stuffed chicken covered with aluminum in the pot for 25 minutes. Then get rid of the stuffed chicken through the water and chill inside refrigerator for thirty minutes. 4. Remove the chicken in the refrigerator and thoroughly unwrap the foil. Place a skillet for the stove and drizzle in 1 tablespoon of essential olive oil. Season the meat yet again with a pinch of salt and pepper, after which place the stuffed chicken into your pan. In order to get the bacon nice and crispy, roll the chicken around as them browns. Remove the chicken in the skillet and hang up aside to rest to get a bit. 5. Deglaze this also pan using the sherry vinegar along together with the bacon juices and oil at the medium temperature. Add the Marsala wine and chicken broth, stirring frequently before the sauce has thickened. Remove the pan in the heat and also the sauce has become ready. 6. Slice in the chicken in an angle, place onto plates and after that drizzle the dish with Marsala sauce. 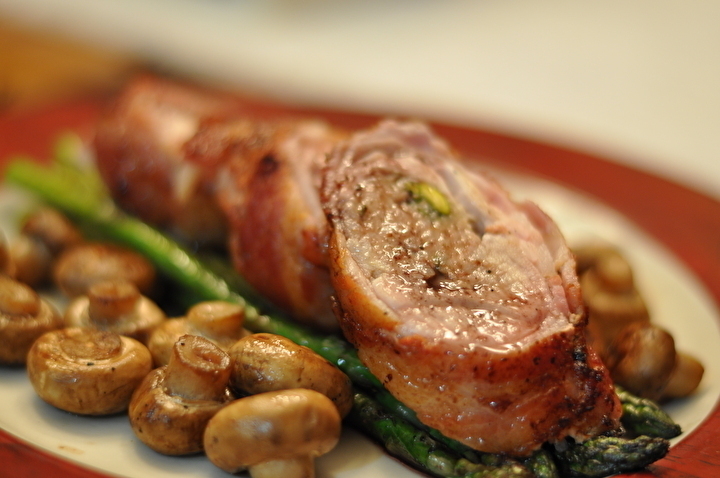 Enjoy your Gordon Ramsey’s Stuffed Chicken Legs with Marsala Sauce!